Virto Bulk Upload can automatically unpack ZIP archives on the server and save folders’ structure. You have to download and install Virto Bulk File Unzip Utility in order to do this. After installing Virto Bulk File Unzip Utility, if ZIP archive if chosen, Unpack archive section appears in the settings. Here you can adjust ZIP archive unpacking after upload to the server. • Save SharePoint properties you defined for ZIP archive for unpacked files. 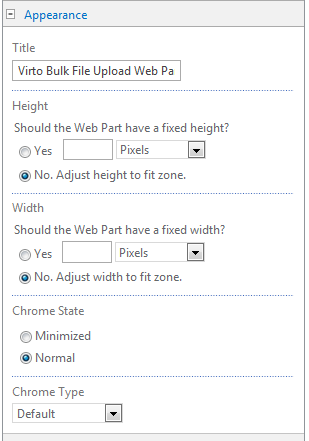 Also, you can change appearance of the web part, define height and weight on SharePoint page and set Chrome state and type. Besides, you can define advanced settings for web part. Appearance on SharePoint page; text description that appears when a user hovers the mouse point on the title or icon of the web part; address to a help file; icons and an error message.